Mouse IgG3 Fc, Tag Free (IG3-M5201) is expressed from human 293 cells (HEK293). It contains AA Glu 97 - Lys 329 (Accession # P03987-2). The protein has a calculated MW of 26.2 kDa. The protein migrates as 33-35 kDa under reducing (R) condition (SDS-PAGE) due to glycosylation. 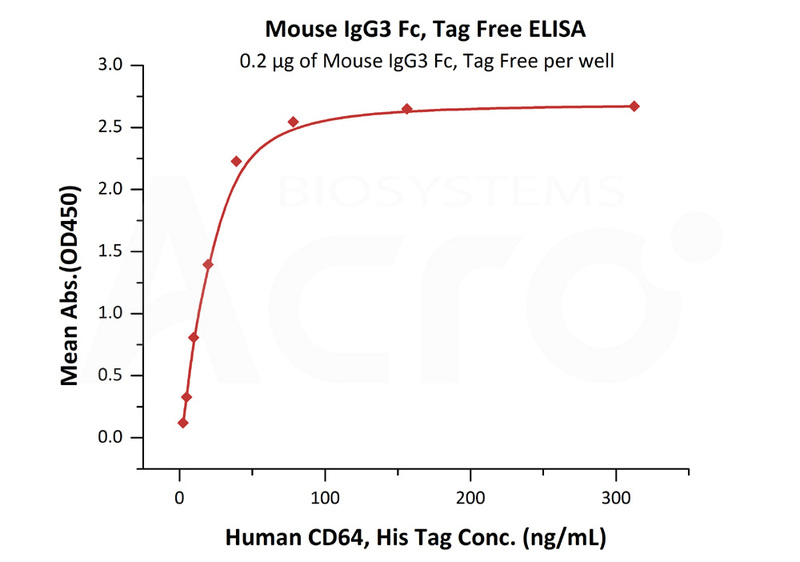 Mouse IgG3 Fc, Tag Free on SDS-PAGE under reducing (R) condition. The gel was stained overnight with Coomassie Blue. The purity of the protein is greater than 95%. Immobilized Mouse IgG3 Fc, Tag Free (Cat. No. 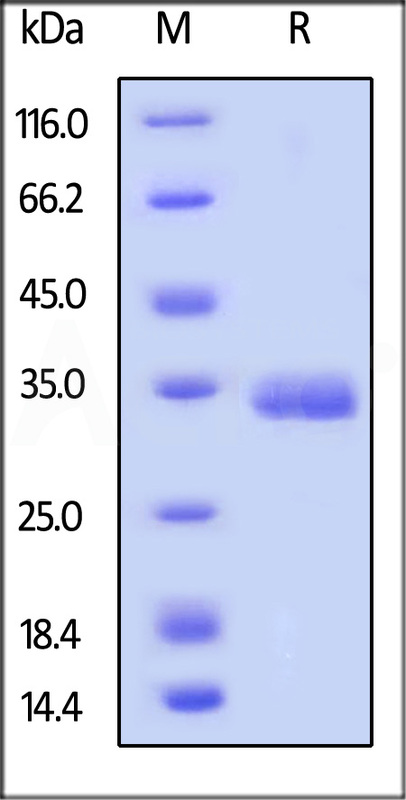 IG3-M5201) at 2 μg/mL (100 μL/well) can bind Human CD64, His Tag (Cat. No. FCA-H52H2) with a linear range of 2-20 ng/mL (QC tested). Immunoglobulin G3 (IgG3) is a member of many immunoglobulin G developed and secreted by effective B cells. In wake of cutting by pepsin, IgG is divided into two F(ab)s with one antigen binding site and a high conserved Fc segment. The Fc segment bears a highly conserved N-glycosylation site. Ig gamma-3 chain C region (IgG3-Fc / IGHG3) contains two constant regions of IgG3 H chain (CH2, CH3). (1) Huck S., et al., 1986, Nucleic Acids Res. 14:1779-1789. (2) Sikorav J.-L., et al., 1980, Nucleic Acids Res. 8:3143-3155.